I'm having fun trying out my new products, coming up with some fun designs for you once the catalogue goes live. Yesterday, I played with the Swirly Bird stamp set*, three of the new In Colours and the Playful Palette Designer Series Paper Stack*. I was intrigued by the Swirly Bird stamp set and it's coordinating Swirly Scribbles Thinlit Dies, which will be bundled come June 1st. I've seen similar shapes on cards and I liked the look of them. I decided to see how the stamped images and the die cuts look together. The new In Colours that I used were Peekaboo Peach*, Sweet Sugarplum*, and Emerald Envy*. They make quite a vibrant palette. 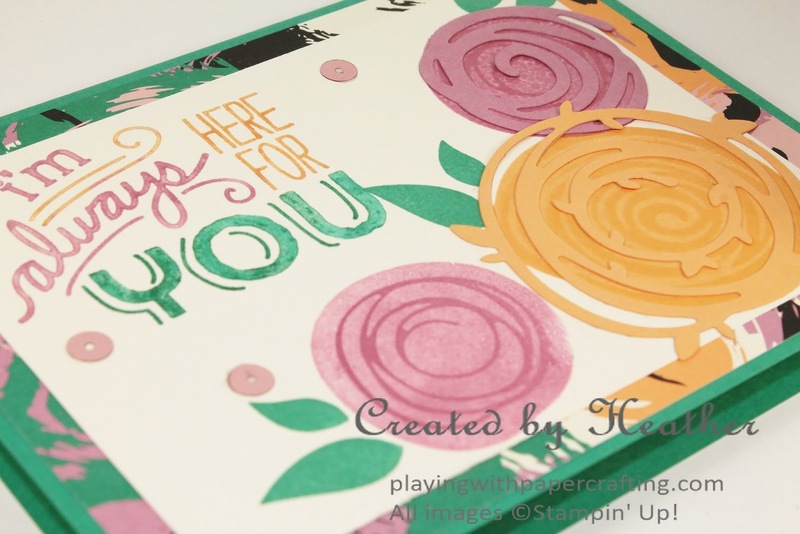 This palette comes from some of the colours in the Playful Palette Designer Series Paper Stack*, one design of which I've used in the background. 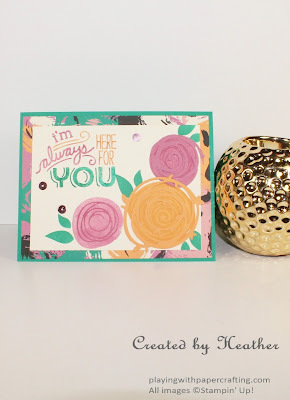 The Swirly Bird stamp set* is a 2 step stamping set and I used that feature on the flowers I've stamped here. I left the paper swirl overlay off of one flower so I could show you the two images together in the flower on the left. The Swirly Scribbles Thinlits* are best die cut using the Precision Base Plate for your Big Shot and the Big Shot Die Brush to extract the paper swirl from the thinlits, because of their intricate nature. If you haven't purchased a Precision Base Plate yet, you might want to reconsider. There are no fewer than 13 Thinlit sets for which the Precision Base Plate is recommended in the new catalogue, and some of them are absolutely gorgeous. The sentiment is from Friendly Wishes which will be in the new catalogue and I inked it up using the new In Colour Stampin' Write Markers, so to have some variety on the different fonts in the image. When you use markers to ink up a stamp, don't forget to huff on the stamp, so that your warm breath remoistens the ink for stamping. That's all for this week! Thanks for stopping by! I'll be back on Monday with more preview. 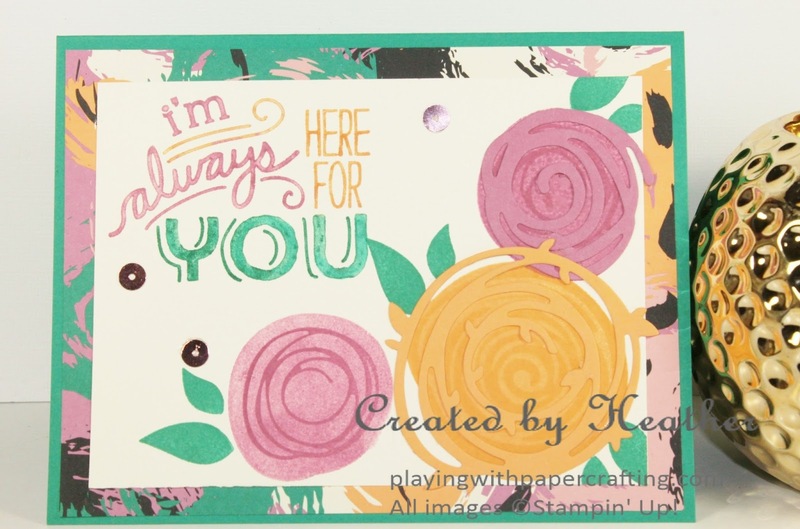 In the meantime, keep stampin'!